The pharmaceutical company is undergoing a global restructuring as it relaunches its brand in the U.S. and Canada. JERUSALEM: Teva Pharmaceuticals has revamped its branding as the company goes through layoffs and a global restructuring. The pharma company launched a redesigned logo and website with its new brand positioning in North America last week. The brand, which will be rolled out in other countries throughout the year, has also launched in France, Russia, and Argentina, said Iris Beck-Codner, EVP of global brand and corporate communications at Teva. "We relaunched our brand on the heels of the recent restructuring," Beck-Codner said. "It provided us with the opportunity to galvanize employees internally and leverage the new brand and look to optimize our portfolio. We wanted to reduce complexity and increase our ability to react to change and keep pace." Teva announced major layoffs and a global restructuring in December, saying the company would cut about a quarter of its workforce, or about 14,000 jobs in 2018 to pay back its debt. The company closed its New York and Washington DC, offices last week and laid off about 200 at its U.S. headquarters in Philadelphia. In Israel, where Teva is headquartered, the company is planning to close two manufacturing plants with about 1,700 employees. "The idea was to look at the global identity to unify [the company] after a decade of acquisitions and to support the transition into a more cohesive organization," Beck-Codner said. "We did not want to do that in a vacuum. It was driven by the changes in the world in general, like the changes to patient-centric care. It was a quest to be more relevant and more future proof." Teva began the rebranding process in 2014, conducting external research of patients, caregivers, and physicians about the Teva brand. The branding was rolled out internally in 2016, Beck-Codner said. With the updated brand positioning, Teva is looking to tell its story and those of its patients. The company has also partnered with Healthline and the Slate Media Group to develop a series of articles, videos, and podcasts. 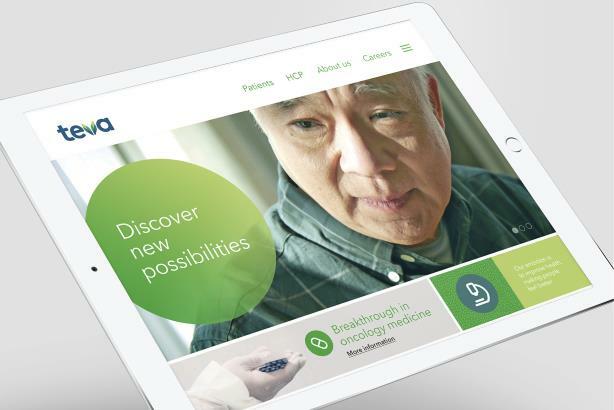 To ensure patients and caregivers find the right health information online, Teva is planning to launch a branded portal in the coming months and will release a documentary about patients with chronic conditions. "The digital content will be from the point of view of patients and the effect on their lives," Beck-Codner said. "Everything is about going beyond the medicine whether it's patient stories, advice to patients or caregivers." Teva specializes in generic drugs and is the largest generic drug manufacturer in the world. Earlier this month, the company warned its fiscal 2018 earnings would be lower than expectations.